This multiple sticker card has three contour cut stickers which individually peel off. Arrange them on your car any way you like. The Florida contour cut sticker has the classic Grateful Dead Lightning bolt in sunset colors. 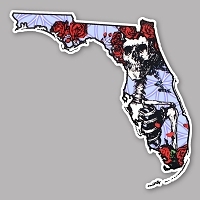 Another sticker has psychedelic lettering "Florida Deadhead". At the top of the card, we included an area to peel and punch for wholesale display as a hang tag for wholesale display. A Peacemonger logo sticker may also be peeled.